Linda Bankier from Berwick Record Office will be giving a talk on Friday 17 June 7pm-9pm on the Impact Of Computers On Archive Research at the William Elder Building, Castlegate, Berwick Upon Tweed, TD15 1JT, England. Map. 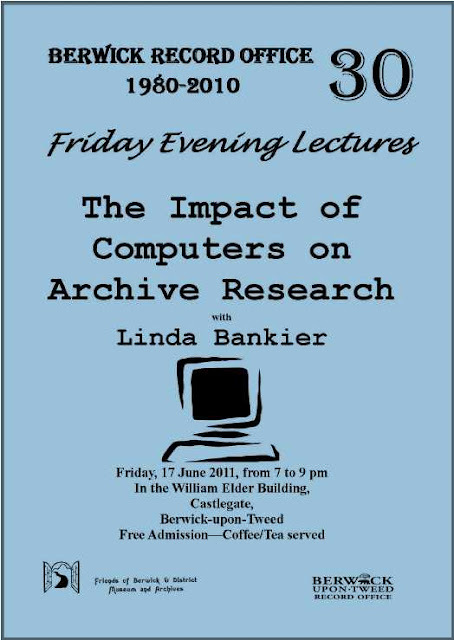 Come and find out how to make best use of your computer when researching family and local history! Free admission, everyone welcome and refreshments available! Don’t miss it!